Gorgeous necklace. I wear it for work and evenings out. Simple and elegant! While the necklace was not expensive, it looks EXPENSIVE and I combine it with earrings and bracelets that match! Add a touch of timeless charm to your look with the delicate luster of this Miadora Tin Cup necklace. The lovely necklace features 13 semi-round freshwater pearls, scattered across a 10-karat yellow gold Singapore chain. The delicate necklace secures with a spring ring clasp. The Miadora White Pearl Necklace is absolutely gorgeous. The pearls are shaped perfectly, they are a beautiful white and the gold chain in between the pearls sparkles. I wear this necklace all the time. You can easily use it from day to evening attire. A must have for any wardrobe. The Miadora Yellow Gold white freshwater pearl tin cup necklace is very nice. The pearls look great on the spacing of the chain. The chain is a little thinner than I would have liked but over the necklace is nice. I plan to wear this to a wedding reception I have next week. It’s a gift for my wife. She loves pearls and this is the third piece I’ve ordered from overstock. She was very happy with the first two pearls jewelry I ordered so I’m sure she’s gonna love this piece. The price was great and it’s even better with the discount overstock offers! I daily recommend overstock to friends and family all the time! With this piece it’s should perfectly match with the earrings I bought earlier. I’ve made a mistake of buying sterling silver and wife didn’t like it, so with this being a real gold and pearls it’s totally gonna be a perfect Christmas gift for her. Would love to see more pearl products and style here at overstock. The chain is very delicate, but since it is 10K gold (rather than 14k), it should be sturdy enough. The pearls are obviously not round, but in fairness they were described as "semi-round." Not bad for the price, but not a real bargain either. I plan to keep the necklace. I love this necklace and use it almost everyday. I get a lot of compliments for the necklace. When I received my necklace, it was in a knot. It wasn't put in a necklace box. It took me forever to get it out of that big knot. Once I got it fixed. it was absolutely beautiful. This pearl necklace is beautiful! I got it for my lady and she loves it. The size of the pearls is perfect and the size of the necklace the same. Beautiful! The pearl necklace is very beautiful! The quality of pearls is excellent. Looks stunning when worn. I love ❤️ the set very much. Just ok.. Tiny spring-ring clasp. Appears quite fragile. Worn 2x and rec'd compliments. Wear it all the time. Goes with jeans to the orchestra. Pearls are good size. This is an absolutely lovely necklace. The luster of the pearls is beautiful...I have gotten so many compliments. Just love this my newest piece of jewelry!!! I really appreciate the quick shipping and quality of this necklace! My wife loves it and I would definetely order more of this brand as well as reccomend it to friends and family. Love the necklace. Very dainty. Gotten several compliments. Perfect for office. I am very satisfied with this purchase and would purchase again. I keep this for myself. I love it. We got this for our daughter-in-law for Christmas and she really liked it. She put it on right away and the next time we saw her (weeks later) she was wearing it again. It is a delicate, lovely piece. Dimensions are: 7.5 mm wide x 17 inches long. I hope it helps. 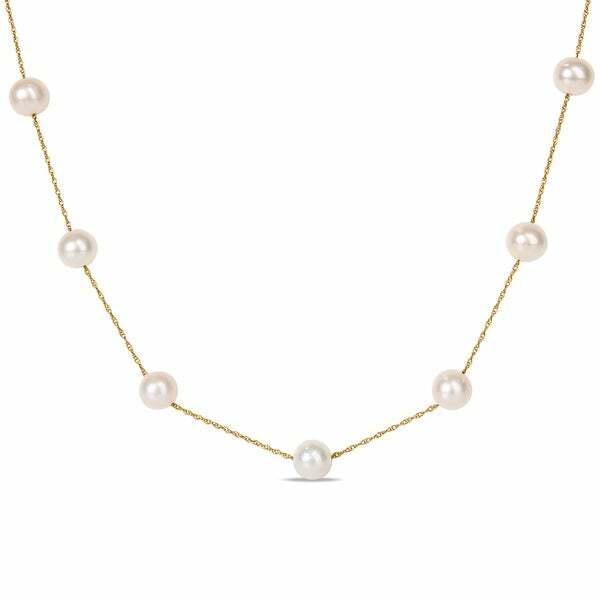 "want 16 inch gold choker with white pearls, maybe baroque pearls"
"Hi I'm looking for something like this but in a 3mm pearl and preferably in a multicolor pearl necklace. PLEASE HELP!!" We are not currently in stock with a necklace with the dimensions and colors requested. Hello overstock, thank you for your interest in this necklace. There are 13 pearls. If you have any other questions please let us know. Have a great day! For my niece's Sweet 16th Birthday. "What is the length of the necklace?" Hello ++++++++++++++++++++++++++++++++++++++++++++++++++ the length of the necklace is 17 inches. Hope you have a great new year!